Your utility bill contains various types of charges. Some of these charges increase or decrease depending upon how much electricity you use. Other charges, known as fixed charges, do not. Virginia’s investor-owned utilities can impose a “standby” demand charge for residential solar systems of over 10 kW (AC rating). A demand charge is calculated based on the user’s greatest (peak) energy demand over a 15-30 minute period. Utilities previously limited this practice to large commercial and industrial users. 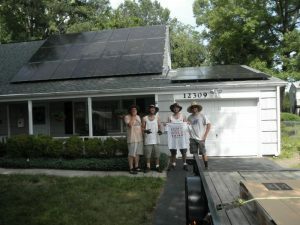 In March 2011, the Virginia State Corporation Commission (SCC) passed a measure allowing Dominion Energy to charge solar homeowners with systems over 10 KW a standby charge. In 2014, Appalachian Power gained approval for a standby charge. Standby charges serve to disincentivize solar by adding monthly charges to the utility bills of solar homeowners. Utilities claim that these charges compensate them for the energy they produce on cloudy days and at night, when solar homeowners would consume energy from the grid. However, in reality, homes and small businesses have relatively little impact on power demand from the grid and don’t warrant a demand charge billing structure. Think fixed charges against solar are unfair? Share the Virginia Solar Declaration of Rights with friends and family and spread the word on how Dominion can better serve its customers. Why standby charges are bogus – In this post from her blog Power for the People VA, energy writer Ivy Main debunks electric utilities’ claims that standby charges are needed for business, and shows how utilities designed them to block competition. Status Report: Implementation of the Virginia Electric Utility Regulation Act – This 2012 report from the Virginia State Corporation Commission describes how Dominion Virginia Power, the state’s largest utility, is allowed to use standby charges. SB 140 – This page offers a history of the standby charge vote in Virginia. SCC approves standby charge on large solar projects – This Richmond Times-Dispatch article from 2011 covers the decision by Virginia regulators to allow Dominion Virginia Power to charge an extra monthly fee to customers with solar systems larger than 10 kW. Standby charges in Virginia – This Department of Energy page summarizes the current status of standby charges in Virginia.